‘It’s true that more and more people are beginning to speak out about the many abhorrent abuses that occur within the animal industry, and the movement to ‘improve conditions’ for these animals continues to gain popularity. 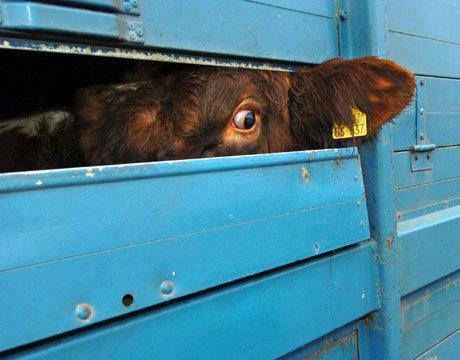 And yet, each one of the awful practices that animal advocates protest passionately against – intensive confinement, enforced insemination, separation of mother and child, castration, de-horning, tail docking, de-beaking, mulesing, de-toeing, live scalding, force molting – all of these horrific procedures, and many more, exist because an ever-growing number of human consumers continue to create demand for animal products. To an industry that views sentient beings as economic units – money-making machines – it is unavoidable that such violence will be viewed as an acceptable means to the end of delivering products that turn a profit. See http://www.peacefulprairie.org/humane-myth.html for a most excellent illustration of standard practices. This entry was posted in Quotes and tagged abolition, commodification, moral choices, Torture, veganism, violence. Bookmark the permalink. There is and never will be a humane practice in the raising of any animal for pleasure, entertainment or consumption. None, period.